Being one of the sensational TV personalities in this century and keeping your personal life private, is a tough thing unless you are Hallie Jackson. Yes, Hallie, a correspondent for NBC news has kept her life a secret and has managed to hold her reputation as a private person. We might get to know a lot of things about her professional life, but when it comes to her personal life it is a mystery. So, what do you think how is her married life going on? We have all the exclusive details of her personal affair here!!! Hallie and her husband Doug Jackner were college friends who, later on, turned into sweethearts. They dated for a while and engaged in May 2010. It was not Hallie who announced her engagement. Rather, it was the public who noticed the reporter flaunting a beautiful engagement ring on her finger. It tickled the engagement rumors, but Hallie still kept everything up to herself. Just after a year of engagement, Hallie and Doug exchanged vows in the fall of 2011. It was a formal ceremony among family and close friends held in Perkasie, Pennsylvania. 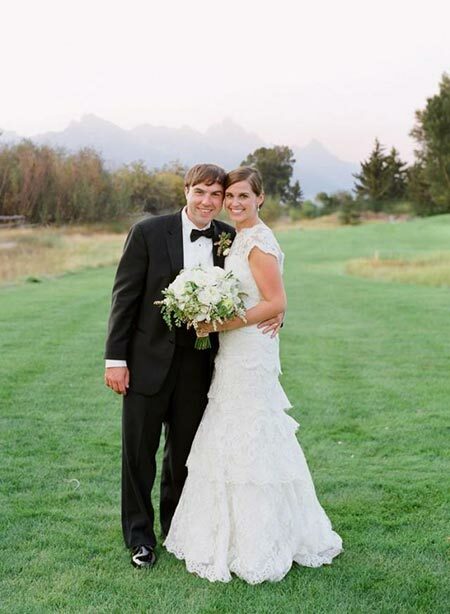 Hallie Jackson and her husband Doug Hitchner on their wedding. The couple did not want the public to know about their marriage so no media was involved in it. As said earlier, Hallie has not disclosed any of the information regarding her husband, Doug. However, it is sure that the two are happy in their relationship with no signs of divorce. Also Read: Meet the new Chief White House Correspondent for NBC, Hallie Jackson. See who is her inspiration? Well, it is not confirmed whether the girls in the photo are their daughters or not but they seem very close to the couple. The private and secretive nature of Hallie has made us very difficult to know about her life. However, she seems very happy and we wish all the very best for the couple!!!!! Hallie started working as a correspondent for NBC in 2014. Before that, she worked as a reporter at the Hearst television. Every person has some embarrassing moment in life. Hallie also has got one few months before, while she was covering the Republican Presidential nomination race, which was live on tv, her nose started running. It must have been the worst nightmare for anyone else with running nose on live tv with thousands of viewers but not for this dedicated reporter. She did not get distracted a bit by this incident and continued with her story. This way the dedicated reporter, Hallie Jackson handled such awkward situation like a pro. Currently, Halley is busy covering the 2016 US presidential election. This time most of the reporters are women, including Hallie Jackson, Andrea Mitchell, Chris Jansing, Kelly O'Donnell, Kristen Welker, Katy Tur, and Kasie Hunt. Despite the fact that Halley is a media person, Hallie Jackson has been able to keep her life in a private status. It may be because her husband Doug does not want to come into limelight. Or it may be the personal decision of Halley. Whatever the reason may be, all we want is she may lead a blissful life with husband and children.